Unlike other renewable energy sources,( solar power, wind energy), geothermal energy is continuous. Power generation is not dependent on weather, or any seasonal factors. Geothermal reservoirs come from natural resources and are naturally replenished. Geothermal energy is therefore a renewable energy source. Sustainable is another label used for renewable sources of energy. In other words, geothermal energy is a resource that can sustain its own consumption rate – Unlike conventional energy sources such as coal and fossil fuels. Because geothermal energy is energy in and of itself, no outside sources of fuel are needed to keep the power houses running. Worldwide energy consumption – about 15 terawatts (TW) – is not anywhere near the amount of energy stored in earth.However, most geothermal reservoirs are not profitable and we can only utilize a small portion of the total potential. Geothermal energy is a reliable source of energy. We can predict the power output of a geothermal power plant with remarkable accuracy.This is not the case with solar and wind (where weather plays a huge part in power production). Since they occupy less room for power generation, maintenance is easy and nearly negligible. It does not require regular servicing. 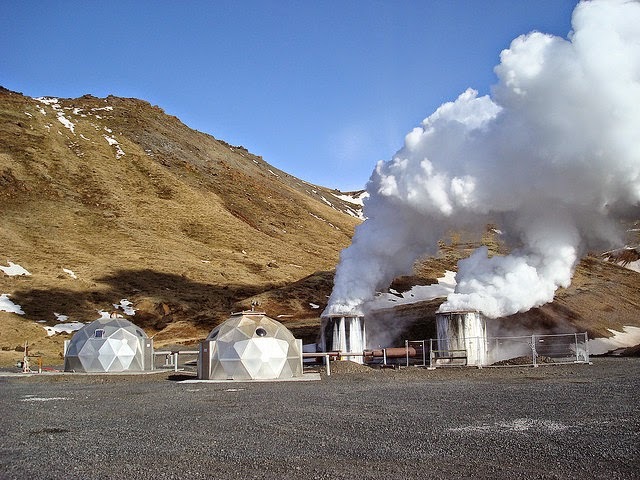 There is no generation of any bi-products during the extraction of geothermal energy from the hot spot. So energy efficiency is more. There is an abundance of greenhouse gases below the surface of the earth, some of which mitigates towards the surface and into the atmosphere. These emissions tend to be higher near geothermal power plants. Geothermal power plants are associated with sulfur dioxide and silica emissions, and the reservoirs can contain traces of toxic heavy metals including mercury, arsenic and boron. Construction of geothermal power plants can affect the stability of land. In fact, geothermal power plants have lead to subsidence (motion of the earth's surface) in both Germany and New Zealand. Earthquakes can be triggered due to hydraulic fracturing, which is an intrinsic part of developing enhanced geothermal system (EGS) power plants. Commercial geothermal power projects are expensive.The exploration and drilling of new reservoirs come with a steep price tag (typically half the costs). To get geothermal energy, requires installation of power plants, to get steam from deep within the earth and this require huge one time investment and require to hire a certified installer and skilled staff needs to be recruited and relocated to plant location. Moreover, electricity towers, stations need to set up to move the power from geothermal plant to consumer. You just can't set up a geothermal power station anywhere you want. First of all, you'll need a location that offers just the right kind of hot rocks. Just any hot rocks won't do, since some rocks might prove too strong to drill through. These rocks also need to be within a reasonable depth to make drilling down to them a feasible option. Good geothermal reservoirs are hard to come by. Some countries have bee blessed with great resources – Iceland and Philippines meets nearly one third of their electricity demand with geothermal energy. If geothermal energy is transported long distances by the means of hot water (not electricity), significant energy losses has to be taken into account. Rainwater seeps through the earth's surface and into the geothermal reservoirs over thousands of years. Studies show that the reservoirs can be depleted if the fluid is removed faster than replaced. Efforts can be made to inject fluid back into the geothermal reservoir after the thermal energy has been utilized (the turbine has generated electricity). Geothermal power is sustainable if reservoirs are properly managed.This is not an issue for residential geothermal heating and cooling, where geothermal energy is being used differently than in geothermal power plants. Geothermal sites can run out of steam over a period of time due to drop in temperature or if too much water is injected to cool the rocks and this may result huge loss for the companies which have invested heavily in these plants. This difficulty can be overcame by extensive initial research before setting up the plant. Other energy sources such as Coal,petroleum products can be transfer to other regions from where it is mined. But geothermal energy is not transferable. Once the tapped energy is extracted, it can be only used in the surrounding areas. 8. Higher Possibility for hazards during construction. Unlike solar or wind power, geothermal energy is independent from Sun. If too much cold water is pumped to the hot spot inside the Earth, it could cool the rocks too much, resulting the geothermal spot inactive. Comment your opinion below.